This is a snorkeling set from Seavenger that is, in our opinion, a step above the last Seavenger snorkel set we reviewed. We prefer the dual-lens masks here at the SnorkelStore.com. You will find those that believe that a single lens mask makes for better snorkeling and wider, more-open views and we agree. However, we find that you get a better seal between the face and the skirt with a dual-lens mask. Also, if you choose to order the pink color (as pictured above) then you’ll also be making a contribution National Breast Cancer Foundation. While the prices of the two sets are comparable, this set has a couple more color options as well as keeping the same Seavenger quality. 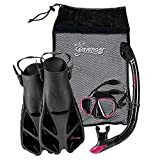 You could do a lot worse than using this Seavenger snorkeling kit as you begin your snorkeling adventures anywhere in the world. You still get a panoramic view with this dual lens snorkeling mask of tempered glass. The skirt is soft and forms a nice seal. In fact, when we tested this snorkeling set we had zero leakage after a few hours of use. The best kind of snorkel to have on the water is a dry top snorkel. It prevents splashed water from the surface getting in the tube and keeps the top close as you submerge. We always recommend a dry top snorkel when buying snorkeling gear and sets. These trek fins are powerful enough for snorkeling as well as agile enough for bodyboarding. There smaller size also makes them the ideal travel snorkel fin. Designed for speed, power, and agility. These are multipurpose snorkel fins. Plastic/mesh design with a drawstring. The entire set fits into this bag with some room for a defogger and sunscreen. This is complete snorkel set that is great for traveling or to throw in the back of your car for those times when snorkeling is readily available.